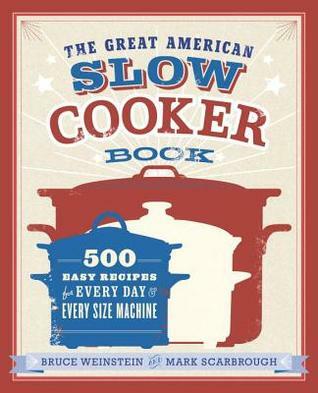 The ultimate in slow-cooker books–with 500 recipes, each adapted for three sizes of appliance. From breakfast to soups, mains to grains, vegetables to desserts, this guide is the only book you’ll ever need to master your slow cooker or crockpot. Millions of people are turning to slow cookers for their weeknight meals yet often can’t find recipes that match their exact machine. Adapting recipes meant for a different-size cooker doesn’t work–getting the right level of spice in your Vietnamese soup or keeping pulled pork tender requires having ingredients in the right proportion. But now, Bruce Weinstein and Mark Scarbrough have decoded slow cookers, and each of their recipes includes ingredient proportions for 2-3 quart, 4-5 quart, and 6-8 quart machines, guaranteeing a perfect fit no matter what machine you own. Each recipe is labeled for its level of difficulty and nutritional value, and they cover every kind of dish imaginable: delicious breakfast oatmeals, slow-braised meats, succulent vegetables, sweet jams and savory sauces, decadent desserts. This is the slow cooker book to end them all. Before you even start looking up recipes in this book, it would benefit you greatly as a chef to read the introduction and tips in the beginning. This book offers recipes for 3 common sizes of slow cookers, so you will need to know the size of your before you attempt any recipes. Once you get to the recipes, you are greeted with a wide variety of dishes and ingredients, some common, some more obscure. I like that this cookbook has slow cooker dessert and breakfast recipes, which for some reason are few and far between in most places. The best part about this cookbook is that the reader knows that all the recipes contained within have been tried and found true. At the end of each is a footnote that will help you achieve slow cooking success. I’m glad to add this book to my collection and I know I will be referencing it often. Posted on August 19, 2014, in books, reading, review. Bookmark the permalink. Leave a comment.